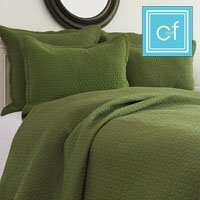 These solid color quilt bedding ensembles from C&F Enterprises can be used by themselves or as coordinates to other sets. If you need just a throw pillow or a complete bedding set, the rich colors and the fine quilting of these bed sets will enhance your bedroom. Please allow approximately 3 weeks for delivery of these items. 100% cotton face with fine quilting, cotton filled, prewashed. Solid color bedding is fanastic to decorate with. Although prints can look fantastic, they can be difficult to work with. Think of using solid color bedding as a backdrop. Interest and variety can be brought in with a throw pillow on the bed or a special object in the room. Another way to use solid color bedding is to use it as an accent for other bedding that has a print. Use the solid quilt as a cover that shows when the top quilt is pulled back or fold the solid quilt at the bottom of the bed. Solid color pillow and shams are also good accents for print bedding.